As with many Porsche lovers, I wasn’t sure what to make of the Panamera when it first appeared over a year ago. I still wasn’t too sure when I first saw it in person at my local dealership, but by now it has definitely grown on me. While I originally saw signs of Corvette in the larger front end wings, now I see Porsche gracefulness and appreciate the automaker’s conscious effort to bring the line together not only with headlight clusters and LED running lights, but also with the arches and “v”s in the bonnet. 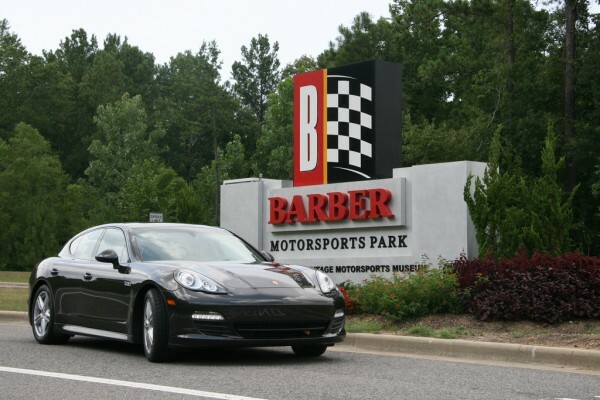 So, it was with anticipation that I traveled to Birmingham, AL to examine the new Panamera V6 up close. When we first arrive in Birmingham, Porsche’s friendly staff usher us to the first of six very striking V6 Panameras. Visually, these are really like no other on the road today; the cars make a statement even while parked in a dimly-lit and humid airport parking garage. The first Panamera feature we get to examine is the trunk space: in go three maxed-out carry-ons and 3 lap top bags. Somehow, I am chosen to drive first. I slide onto the seat, comfortable and lower than one would expect for a sedan. One of the features I enjoyed when I first got to sit inside the Panamera in 2009 was the way Porsche maintained the intimate sports car feel in the cockpit. The controls are predictable, and I quickly set my own climate-controlled seat, mirror and wheel settings as my co-pilot reviews the 1 hr 30 minute “long” route to Barber Motorsports Park. Something all journalists in the car quickly agree would be very welcome in this car is ventilated seats. Birmingham’s 98 degree temps immediately put the Panamera’s climate control system to the test, and the lack of ventilated seats was disappointing. (Porsche, we know you have some really nice ones because we enjoyed them in the all-new 2011 Cayenne, and they made us forget it was nearly three-digits outside). I leave the car in the normal mode and navigate the tight concrete walls and curbs of the parking structure. Immediately, the car feels bigger than the V8 Panamera S I drove last October, although it is in fact lighter (about 3800lbs). The additional 100hp and 74 lb-ft torque in the V8 makes the Panamera feel agile and manageable, and is missing in the V6 model. As we merge onto Alabama Highways, the power delivery is very smooth and linear, and the 3.0L 90-degree six cylinder engine revs up, but it does so with perceptible effort. The athletic lineage is there, but this Panamera feels more like a long distance runner making his way up hill at challenging altitude. All Panameras come standard with PDK, and while this “automatic” shifting system is highly advanced, I found its desire to constantly shift up somewhat frustrating. Cruising at 45 mph, the Panamera would work its way to 7th gear, no doubt in order to maximize fuel economy. While I understand Porsche needs to map the gear settings to conserve, this sensibility made for an uninspiring drive. Apparently, there is hope: folks at Porsche told me if I were to drive the car for a week, the transmission would learn my driving style and adapt to better suit it. I wonder for a moment whether my Panamera would become averse to shifting itself anywhere below 4500 RPMs?? Alas, I won’t get the chance to find out on this drive. As is to be expected in a car filled with automotive journalists, I was quickly encouraged to try out a few of the options offered by the Panamera. I knew just where to start: if there is a “SPORT MODE” button on any vehicle, it is usually the first one I want to push. I briefly questioned why anyone would want to have such a button in an almost two-ton, 4-door saloon, but I soon learned that you not only want such a button – you should have it. As soon as I engaged SPORT MODE, the shock stiffness, engine mapping and (more importantly) the transmission setting immediately change, and I am no longer driving 3 gears higher than I wished I were. On the subject of gears, I should mention that I did try the Panamera’s “full manual” mode, and quickly found that there is a reason why the highly-developed PDK transmission always starts in 2nd. Unless you’re ready to take the proverbial bull by the horns or are planning on ascending a wall face, stay away from 1st gear. In addition, my initial complaints about the PDK shifting system still holds true: I still have to think about pushing the button towards the hood to up-shift (vs. the more intuitive opposite) and it still feels like it takes just a little too long to shift up. The PDK does such a good job in auto, I suggest you just pretend there is no other mode. You can always pull the paddle toward you and be rewarded with a completely seamless downshift, hand the shifting duty back to the PDK, and watch it shift up for you when appropriate. During the next 15 miles of scenic, hilly back roads peppered with expansive Southern estates, I re-think my critical views of the car. The Panamera V6 has complete willingness to attack corners, floating deftly into theoretical apexes. The car’s handling is suddenly pure Porsche, and the attention to detail Porsche engineers are known for is very obvious behind the wheel. In SPORT mode, it is as if the Panamera has had a shot of Brazilian espresso, and it has become animated and enjoyable to drive. This car has incredibly good balance, and coupled with a tire developed specifically for providing excellent road hold and poise it offers sports car characteristics rare in bigger cars today. Is the Porsche Panamera V6 Right for You? The Sedan that you thought Porsche would never produce now has a front V6 engine and a 4-wheel drive model. The V6 is the entry level model for the four dour saloon, and it boasts a 3.0l, 300hp, 295 lb-ft torque engine based on the V8 model (ready to install, the motor minus two cylinders weighs only 404lbs). Porsche engineers have drawn on their extensive performance knowledge, incorporating all aluminum engine block and cylinder heads, four valves per cylinder with four overhead camshafts, Vario Cam Plus and Direct Fuel Injection. Porsche decided to stay with a 90 degree V configuration to keep the motor low and allow them to push it back from the front axle. This required them to use a very light balance shaft very low down in the engine (in the oil pan, actually.) The result is a smooth and civil motor. The car weighs in just over 3800 lbs, which is great for a car in this segment (but, admittedly, a lot of weight for 300hp). The four wheel drive model weighs in at 4012 lbs, but still accelerates to 60mph in only 5.8 seconds (with the optional Sport Chrono Plus Package the time falls to 5.6 seconds). These numbers are impressive when you consider these were once air-cooled 993 0-60 times. So why did Porsche build a Panamera with less zip? For starters, fuel economy. Porsche claims the combined fuel economy around 24 mpg (18 city / 27 hwy), but early tests show fuel economy is even better, as high as 30mpg on highway (vs. the 4.8L V8 Panamera S’s 16 mpg city / 24 mpg hwy). Indeed, Porsche is very proud of the fact that no Panamera model is subject to the gas guzzlers tax. Porsche has already built 25,000 Panameras, 4000 of which they have sold in the US since last October. Their goal is to sell as many V6 variants as V8. Cost and accessibility are two other big reasons. One may wonder why anyone would buy a $75k sedan instead of a $90k sedan. For starters, there's the not-so-small $15,000 difference and the car is still 100% pure Porsche. On the highway off-ramp, at speed or in your favorite twisty bits, you can float the car into the corner and enjoy a sedan like no other. The brakes don’t fade, even after some hard laps on track. It is incredibly well engineered for comfort and poise on the road. Despite the car's size, the rack and pinion steering does keep a nimble feel The power delivery is very smooth and if you keep it in sport the standard PDK transmission keeps you interested and allows you to just drive the car (0-60mph is a respectable 6.0 seconds, 5.8 with the Sport Chrono Package). Last, but not least, along with the driving pleasure, the Panamera V6 maintains the fit and finish of the S and Turbo models, providing comfort that is not available from competitors. All in all, the Panamera V6 is a great way to own a Porsche while sacrificing nothing but a bit of power.